‘Desperate and hot.’ That’s how Miller wanted his Witch Trial / Cold War hysteria tale to play; stoke the fire till someone gets burnt. Whilst at the time of debut in 1950s America the piece served a political purpose, sixty odd years later, we can appreciate the wider themes of group-think and guilt. In this production, directed by Geoff Brittain, the essential drama is delivered in a powerful and solid fashion. Despite a few misfires in delivery, the odd uncertain accent and some overly shouty bits, the acting was generally good. 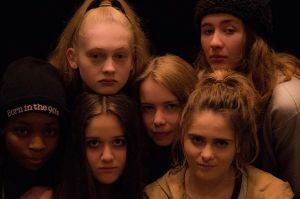 Of the brat pack, Rhoda Sylvester as Tituba, Zoe Miller as Mary Warren and in particular, an acrobatic Gabi Douglas as Betty Parris, were standouts. Of the various ‘outsider’ characters, Ben Todd, as Reverend Hale, achieves a weirdly apposite portrayal of a man with “the pride of the specialist whose unique knowledge has at last been publically called for”, but who finds himself mired in black arts that are all-too-human. 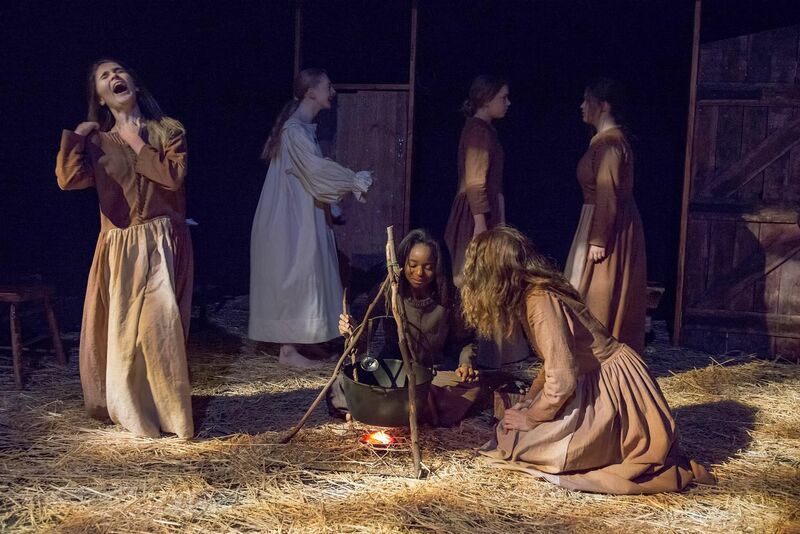 The key roles in the play form the triangle of John Proctor (Kim Clark), his wife Elizabeth Proctor (Cheryl Douglas), and the opportunistic Abigail (Zoe Dibb). Whilst Abigail’s part recedes along the way (you can picture her in a carriage en route to Boston, flinging her bible onto the verge), the strength of the troubled, married couple builds brilliantly in the third and fourth acts, when their love and faith is sorely tested. Clark is superb as the tragic Proctor – a true star turn. The stark sets are good, the lighting effective and costumes satisfyingly apt. Miller’s later works were generally attacked as priggish…having, in one critic’s opinion, “the same old noisy virtue and moral flatulence.” Actually, this tendency manifests itself in virtually all of his plays, Greek tragedian that he was (in spirit). That includes The Crucible, but this failing doesn’t matter – it can be managed, or overcome – providing true conviction and feeling is brought to the play. This production delivered that.